This recipe was born one night when I had a leftover sweet potato, black beans and some asparagus in the fridge. I decided to pop the potato in the oven, then fry the asparagus and black beans on a pan with some garlic. I was really surprised how well it went together and made it again and again. This recipe is a bit juicier than the original 3 ingredient one but it's really simple to just use any leftover veg you have to fill the sweet potato with and then pour the dressing over. Bake the sweet potatoes in the oven at 190 degrees for about 30-40 min or until you can stick a fork through easily. Steam cook the asparagus, takes about 10-15 min. Slice the onion and press the garlic and add to pan, fry together and then add the black beans. Fry for a bit longer together and then set aside. Slice the tomatoes and set aside. Mix the ingredients for the sauce together in a bowl and use the warm water as necessary to thin it out, I used around 1/4 of a cup. 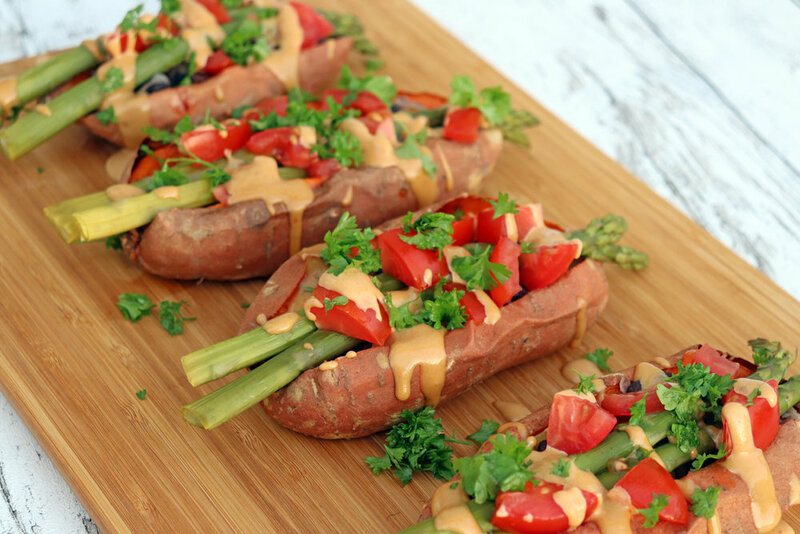 When the potatoes are ready and baked slice them 3/4 down the middle and fill them with the bean mixture, asparagus, tomatoes and then drizzle the sauce over. Garnish with parsley.